The Metropolitan was completed in 2004 and is home to 342 residences at 331 1st St. in the South Beach neighborhood of San Francisco. Home sizes at The Metropolitan range from approximately 500-square-foot studios to 800-square-foot one-bedroom homes to 1,200-square-foot two-bedroom homes. Building amenities include a fitness center, sauna, spa, movie screening room, pool, library, rooftop terrace with barbecue, business center, club room with kitchen, and 24-hour doorperson. With two towers — one 20 stories high and the other 26 — the Metropolitan SF houses 342 homes ranging in size from approximately 500-square-foot studios to 800-square-foot one-bedroom homes to 1,200-square-foot two-bedroom homes. Construction was completed on this neighborhood pioneer in 2004. Depending on location within the buildings, some homes have views of downtown, the San Francisco Bay or the southern hills. To maximize the views, the project was constructed with floor-to-ceiling windows in the living areas. Some homes have private balconies or decks, and all have access to a shared terrace area. All homes at the Metropolitan have central air conditioning, which is somewhat unusual in San Francisco but welcome on warm summer days in South Beach, known for some of the best weather in the city. Construction within the Transbay development area to the north will change the views of north facing homes, while south-facing homes have already had their original views modified by Rincon Hill construction. The changing views, while not unique to this building, are a great example of how neighborhood changes can impact you. Residents at the Metropolitan have very easy access to the Bay Bridge (the entrance is half a block away at 1st Street @ Harrison), 280, and the Embarcadero. Public transportation options are in the vicinity, with MUNI stops about six blocks away on the Embarcadero and also on Market @ Montgomery. Self-park in an enclosed four-level below-ground parking garage. The Metropolitan offers many amenities to its residents: an indoor pool and spa, fitness center, sauna, party room with a kitchen, a rooftop terrace with a barbecue area, business center, conference room, library and movie screening room. The entry is attended by a doorperson and concierge services are available as well. 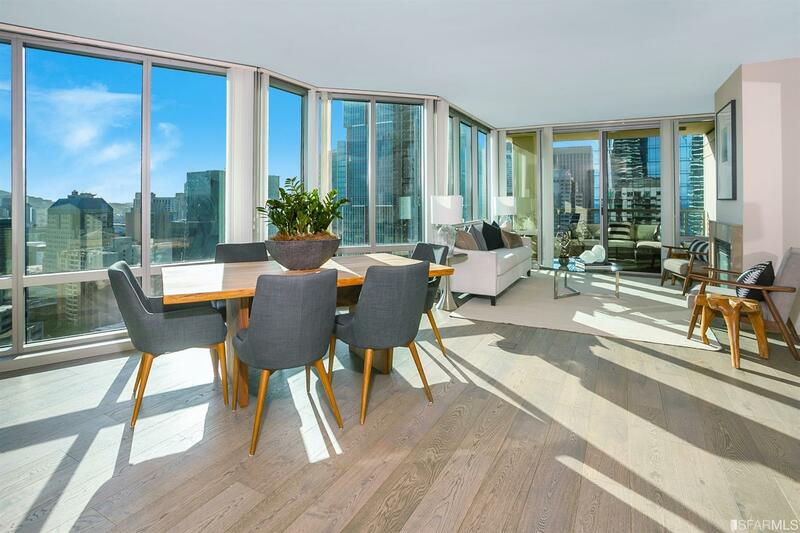 We recommend these because the Harrison is similar but of much newer construction, while the Infinity and One Rincon Hill are also nearby full-amenity large condo tower developments.